Movember, at least for me, has become a bit like Christmas and the holidays season. When corporate planning for it starts, it's earlier and earlier, and soon it will be June when we start talking plans. I've come to dread the anticipation, much like the holidays. Perhaps I dread it even more than the holidays because I'm so un-fond of me in a mustache. At least it's not Beardtober. I think I should recommend giant, spill-over-the-edges, mustaches for laptops this year. Or perhaps I'll just gift one to every single person who asks, "can I start my mustache early?" Snarky: Let me guess, the corporate Movember committee has kicked off early? 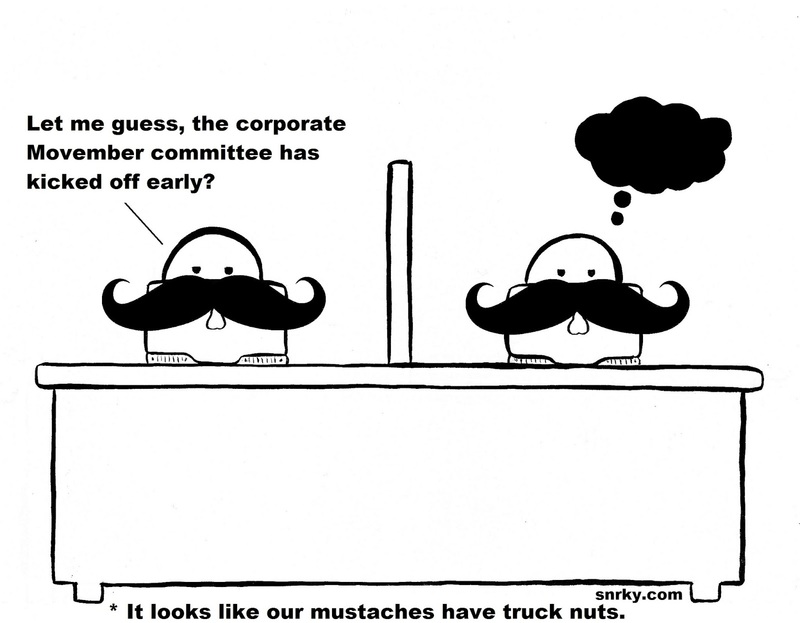 Title: It looks like our mustaches have truck nuts.